- Born Helena Rosa Bertinelli - the illegitimate child of Maria Bertinelli, wife of Gotham Mob Boss Franco Bertinelli, and Santo Cassaemento. - Raised as Franco's daughter, Helena was subject to the same beatings as her mother. - At 8 years old she witnessed the hitman carry out the contract on her family - ordered by Sicilian Don Stefano Mandragora. - Whisked away by her uncle, Tomasso, she stayed in Italy under protection as she grew. - Wracked by nightmares of the killings, her cousin told her that blood was crying out for blood. For vengeance. - Determined to track down the killers - and orchestrators - of her family, Helena began to train for this single minded purpose. - At 15, she was sent to a boarding school in Switzerland due to law enforcement pressure on the Family. - While following the events from afar, she had the epiphany that all of the stories of how good the Family was were all a lie to cover up the crimes committed, the laws broken. - At 16 she visited her uncle in Gotham again only to be present when the Batman raided a Family holiday gathering to apprehend a member. - Seeing the reaction the Batman caused, she was inspired to avenge her family's murders herself. - Returning to school abroad, she began to study the mafia in exacting detail, learning names and methods while also doubling her physical efforts to be capable of carrying out her vengeance. - Now in her early 20's, Helena has returned to Gotham. Employed as a teacher by day, she has begun to set her plans in motion, intent on drawing out every Mob figure even remotely connected to her family's contract and hit. Helena's motivation is to shut down any and every Organized Crime (IE: Mafioso) syndicate she can fine. Starting in Gotham, but also reaching back to Sicily. After all that is from where Don Stefano Mandragora pulled the strings of the whole branch of the Mafia. It is no small undertaking but she isn't about to shy away now. No other child should be orphaned again just at the whim of a Mafia Don. 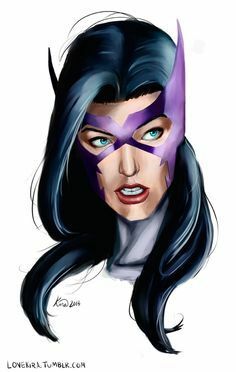 While Huntress may be a cold hearted vigilante intent on killing and destroying the Mob, underneath she still has the same good hearted upbringing her mother instilled within Helena as a child. She wants to love and be loved. She wants to do the right thing, and often will even against her better cold and calculating "better judgment." Helena watched as the hit man systematically executed the man she called Father, her mother, and her (half) brother while hidden in the thick folds of the formal dining room curtains . The trauma, usually as nightmares and sometimes as flashbacks, has stuck with her, forever in her memories. Helena is Italian. She is naturally passionate. She finds a cause and she embraces it whole heartedly. She lives in the moment, seeking to experience. To Live. Even as Helena, the school teacher, she pours every fiber of her being into helping those children succeed. 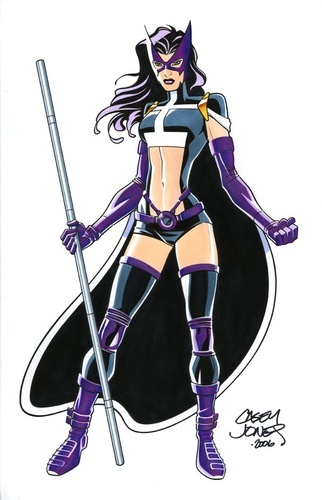 As Huntress? Well.. That passion usually results in deadly consequences for criminals. Helena's goals are multiple. As Huntress, she intends to crush and kill the Mafia. Not just Mandragora's branch of the Mafia 'tree', but the whole thing after that. She's going to hack off branches and limbs and leave the trunk left useless and impotent before cutting it off at the base. And then she is going to dig out the root ball and burn it and pour lime into the soil so it can never grow again. Metaphorically speaking. And not a little literally too. As for Helena? She wants to feel closure. She wants to stop feeling like she let her family down by not being able to protect them. She wants to have a family again. To love. To have friends. To be more than just a self-enclosed woman unable to reach out to others. She wants to settle in Gotham and make the city safe. Just as Batman has, so that she can walk in the sunlight as a citizen and know that she, like everyone is again safe. Huntress would call it calculated risk. The fact is, she is a lone wolf. She hunts her prey alone and she doesn't intend to have help. This is her vendetta. This is her mission. And it means that if a risk must be taken and corners must be cut. The end always justifies the means. Helena was a devout Catholic as a girl and teen. Up until she chose to hunt down Don Mandragora and his minions and kill them in revenge for the death of her family. Years of religion, of ingrained beliefs are not easy to walk away from. Helena has rather mentally likened herself to a Nun - sequestered away for the sole purpose of hunting down and destroying the Mafia. It even gets reflected in her armor with black and white, even the earrings she chooses to wear. Religion, ritual, and procedure are ingrained into her life even if her actions are, largely, unforgivable under Church tenants and beliefs. Helena was able to inherit her mother's estate on turning 18. Compared to most, it wasn't expansive, but she was well cared for between that and life insurance policies. As a result, she has more than enough to live comfortably, and to maintain her equipment, armor, and vehicles. As Huntress, she maintains body armor (rather impractical, but armor just the same) - capable of withstanding small arms fire (pistol/SMG). It will decrease the damage from rifle fire but she will still be wounded. For weapons she has two collapsible mini crossbows, a full sized compound crossbow (all able to fire a bolt into concrete, steel or brick for a strong anchor point), a collapsible bo-staff, and a number of firearms. The crossbows fire a number of different bolt styles: Flares, flash/bang, Stun(blunt tipped), tracking, and grapple/zip line. A utility belt complete with mobile crime scene kit, breaking and entering items, , additional climbing gear and build in harness, etc. Everything a vigilante needs to run amok in Gotham. She has computer gear, observation equipment, tracking devices. Not military grade of course, but good enough for the job she needs them to do. Helena drives a sporty little two door for her day job as a substitute teacher. Huntress, on the other hand, rides a tuned and modified Ducati Superbike 899 Panigale with a matte black carbon fiber body and dark purple and white accents. The motorcycle has been modified and strengthened to handle the rigors of vigilante use in Gotham. Helena has a nice, comfortable apartment but not in the perfect part of Gotham. It offers nice storage for her car, and secluded ingress/egress as Huntress without attracting too much attention. It is furnished very well and with good taste without breaking the bank. Helena still remains in contact with her Uncle and cousin who protected and raised her after her family was murdered. She is seen as a daughter/little sister; she still can go to them for advice, information and possibly resources, though they do not know she is necessarily hunting down the entire Mafia as an organization. She has street contacts as well, in Italy, Sicily, NYC and in Gotham. She also has academic and scholarly contacts in Switzerland and Palermo, Sicily. Helena works as a substitute teacher. While it is only part of the educational system it does potentially afford her access to student records as well as providing her with a modest income source as well. Helena devoted herself to a near fanatical level of physical fitness when she swore to destroy the Mafia. She could easily run a half marathon and has the build and muscle mass to tackle a Crossfit competition and finish in the top ten in her weight class. Helena got into street fights regularly as a teenager. Just to prove she could take on all comers and wasn't about to back down. In an alley fight she is a vicious thing that has learned or developed many similar tactics to Krav Maga mostly on her own. In addition she is well trained in Dragon style Kung Fu - able to take on 2-3 opponents at the same time. She also has trained in the use of staff fighting and carries a collapsible Bo staff. Crossbows, really. Her weapon of choice, Huntress is expertly proficient in both the mini and full sized crossbows she uses and can account for drop or windage as second nature. She's no trick shot like Green Arrow but she's right up there, close in accuracy. With a bow she would be less accurate but not by a lot. Proficient in all common firearms. She has had uncommon access to assault rifles and military hardware available from black market sources to the Mafia as well. Her preference will always be for handguns however. Smaller and easy to wield. She can sight in her weapons and place tight groupings on targets eight times out of ten. Despite her size and strength she can move with no more noise than a cat when she wants to. Batman would know she was coming but most others would have to strain to notice her movements or presence when she is actively trying to avoid detection. Detective skills are an aspect she acquired while learning everything she could about criminology. Part of taking down the Mafia is looking into Mafia crimes and determining how they did it, why, and how to gather enough evidence to turn them in. Or eliminate them. She has the investigative skills of a well tenured FBI agent, certainly not Batman but she'd probably impress him. If he'd ever admit it. She grew up in a crime family. When that revelation dawned on her, the pieces fell into place and everything just made since. She has since attended university in Palermo and graduated with a degree in the field. Combined with her "Family" ties, she is indeed a leading expert on organized crime and the techniques of the Mafia. Helena Bertinelli is a substitute teacher. She typically teaches English-as-a-Second-Language classes but can fill in for most elementary/middle/high school classes as needed. Helena is completely fluent when speaking, reading or writing in English, Italian, German and French. She is conversational when speaking, reading or writing in Romansh and Latin. Not a stunt driver but an accomplished driver all the same. She can comfortably take a sports car to well beyond legal posted speeds and maintain control. With a motorcycle she can perform curb jumps and other stunts quite capably. Helena can be the sultry hot-blooded Italian woman so easily. It's her heritage. She can also come across as innocent or helpless. She's been playing others since her family was killed and she is so very good at it. It is, almost, a secret weapon. Helena was raised to be devoutly Catholic, and attended a Catholic school as is often the case within Mafia families. She understands the weekly ceremony and ritual processes that make up a formal Roman Catholic mass, the foundations of the religion's beliefs and motivations. Helena has adapted to the urban terrain of most cities, being able to traverse the skyline on foot or grapple assist. She can spring, vault, tumble and roll to absorb impact of dropping two stories (more will hurt and surely cause injuries). She is not a natural acrobat as Nightwing, but she can pursue a target and not lose them atop the maze that is Gotham's skyline. As with any vigilante, taking the law into your own hands means someone is going to decide you're breaking the law. That someone is usually Law Enforcement. Maybe other heroes. Having a secret identity keeps Helena safe from reprisals. At least for now. Murderers don't always get away scot-free do they? Perhaps it is her Italian heritage. Perhaps it is the family life she had when little where her step father would blow up in an instant but Helena very often acts on the fly. Makes rash decisions. As Huntress that can be even more dangerous with her bitterness. Helena is so very bitter toward the Mafia and Don Mandragora in particular. He killed her brother and mother. Her step father.. Well he was Mafia and had it coming. But she saw it at 8 years old. She lost her innocence in that moment. It will forever be seared into her memory. And it is very hard not to let that anger and hatred affect her. And then it affects her decisions and relationships. 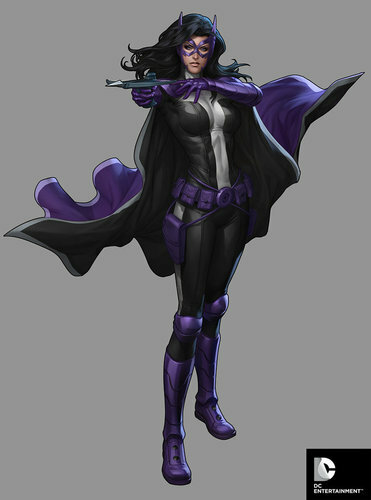 Huntress may throw caution to the wind as she rampages through the Mafia on her reign of vengeance. It does not mean she is invulnerable or immune to damage. This would be so much easier if she were bullet proof like Superman or his cousins. She isn't. She is able to be shot. Stabbed. Suffer broken bones, sprains.. Life as a vigilante isn't gentle or forgiving. All of her equipment is fallible. Weapons jam. Motors fail. It costs money to keep things well tuned. If she is caught and her gear taken away she is just a fit, angry woman with her bare hands. Dangerous but perhaps not so deadly. The Mafia has no love lost for Huntress. They don.t know that she is Helena Bertinelli. God forbid if they ever put it all together and find out. Huntress has enough of a contract out on her head (or will soon enough). Dodging the Mob as Helena would be truly difficult. The Huntress is a new arrival in Gotham. Anyone paying attention will quickly conclude the woman has a (major) bone to pick with the Mob. Already the body count is on the rise since first sightings. All of her targets are either grievously wounded or killed with bolts fired from a crossbow. 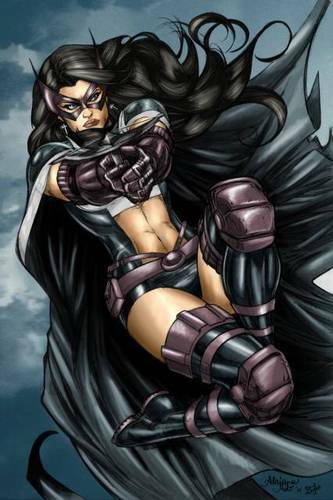 Helena Bertinelli grew up in Gotham for a while as a child. After the death of her family she went overseas to the finest boarding schools in Italy and later Swizterland. She attended university in Palermo Sicily. She has recently returned and works as a substitute teacher in the Gotham school system. She does not seem to be a socialite despite the entitlement her education and studying aboard would typically suggest for a woman as herself in Gotham. (2014-04-23) Nice to meet you.... Again.